So there is this cute blog called Pinterest Told me To where this girl Sheaffer (I mean - how much do I love her name. Almost enough to have a 3rd girl named Sheaffer Stamps. ALMOST) finds those outfit suggestions on Pinterest and then coordinates her outfits with them. I mean we all see those outfit ideas - but do you really try and dress like that after pinning them? 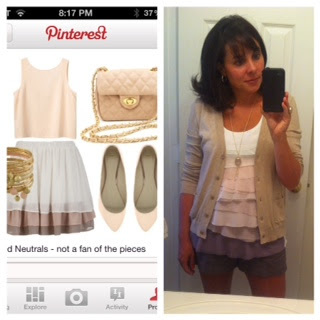 So Sheaffer asked if I would do a guest post - dressing like outfits I pinned on Pinterest. I had to giggle because once again - I'm not a Fashion Blogger - I'm a "pushing 40 years old with two little kids Mommy blogger". I seem to wear a wardrobe of yoga pants, razorback tees and pony tails these days. But I do love clothes and when I actually find an hour in the day to take a shower, fix my hair and wear real clothes - I love to try and look somewhat stylish. So I thought this might be fun. Besides the awkward part of taking pictures of me in the outfits. Or the awkward part where I tried to explain to Scott why he needed to take pictures of me in these outfits. He might have laughed. And rolled his eyes. I had a jean shirt I had bought this year and several maxi skirts. I didn't have a white one but I have this leopard one that I love but rarely wear because I'm not sure about it. ha! I felt like I needed to put my hand on my hip if I was taking a fashion picture. ha! I might have never worn a jean shirt with this skirt but I really liked it after I put it on. My shirt I bought this year at Riffraff. My belt is from Francesca's a few years ago. I love it. My boots I bought last year at Dillards and they are my ultimate favorites even though you can't see them. I had a hard time finding outfits that would match up to things I actually had in my closet. Then I found this little girl and knew I had a similar outfit. Which is either weird for the little girl or for me. Not sure. I didn't put white tights/leggings with mine because that is just not a good idea if you aren't 20 or 95 pounds. (In my opinion). But I have this cute cream dress/tunic I LOVE. I've been wearing it with a cream long sleeved tee underneath because the flowers at the top are really cute and I want them to be seen but I kind of liked pairing it with a cardigan. The cardigan I've had forever and honestly I don't remember where it came from. I wore my suede boots - same with my sweater - no idea where they came from. Have you ever matched an outfit to Pinterest??? ?